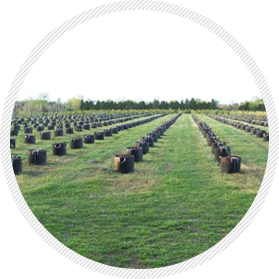 Air root pruning creates a more fibrous root structure with more root tips. 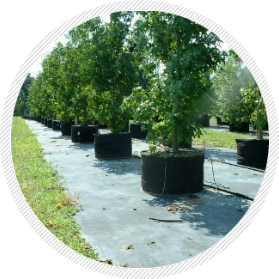 This leads to more efficient absorption of nutrients and moisture for faster plant growth and no harmful circling. 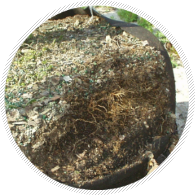 Root circling occurs when the root hits the side of a plastic container and continues growing itself into a nasty knot that jeopardizes the plant. But when the roots reach the side of a fabric bag the root tips stop and lateral root growth begins. 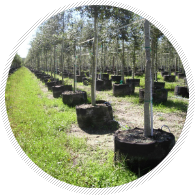 This creates a full fibrous root structure and a healthy plant. The Smart Pot® PRO is made of fabric that releases heat and aerates the root zone. Aeration allows evaporative cooling to occur in the container, extending the growth cycle. container too hot for roots to grow. 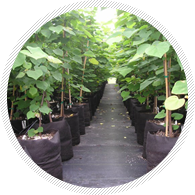 With the fabric pot, heat is released, the full container area is utilized, and better growth is the result. The Smart Pot® PRO is straight sided, with no taper. Making it much more difficult to blow over than a plastic pot. It is a one-piece unit where the fabric bottom and sides work together to hold the plant in place. The fabric bottom contours to the undulations of the ground so there is no “wobbling” on uneven ground. A very limited number of small roots can penetrate into the ground to help anchor the plant. These small roots also absorb additional moisture and nutrients for the plant. 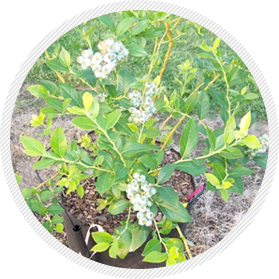 Every growing season begins with determining what you are growing and to what size. That determines how your plants will be spaced out, managed and what system to use. If you decide on an above ground system using the Smart Pot® PRO, the next step is to determine the bag size. The Smart Pot® PRO is available in all sizes, from 1 gallon to 95 gallons and larger. Custom sizes are available. Specialty containers are available for plant propagation. The Smart Pot® PRO is a straight-sided container with no taper. Labeling is in accordance with actual volume, meaning the #5 Smart Pot® PRO holds 5 gallons, etc. During Springtime, the busy season, early orders are greatly appreciated. In general, we always recommend placing orders 2 weeks in advance of when you plan to start using them. Planning is important. 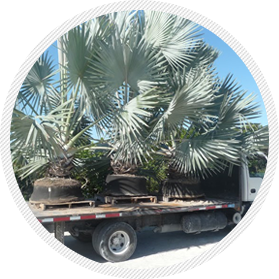 You’|| want to make sure you have your bags — as well as other structural equipment — ready BEFORE you receive your plants or they will sit out there and die. The Smart Pot® PRO is an aeration container. Some growers use a heavier more water retentive mix in the Smart Pot® PRO than you might use in a plastic container. Call us for a full discussion of soil mixes and watering needs for your area. Click here for a list of mix ideas prepared and used by some of our customers. Fill the Smart Pot® PRO tight so that the sides are straight. On larger sizes we recommend using a form that expands to give the fabric rigidity when filling. The form is reusable. Have enough forms to keep your planting crew moving! Watering needs in the Smart Pot® PRO will be slightly different from plastic containers. Many customers find they water more in the first few months, then less compared to plastic containers after the plant has rooted into the Smart Pot® PRO. Keep in mind that the Smart Pot® PRO releases heat, helping conserve water. The mix used will also affect watering needs. The best method of shipping a Smart Pot® PRO plant will depend on your customer and how they want to receive the product. Many use the Smart Pot® PRO as a production tool and remove the fabric at their farm and either containerize or box for shipping. Other customers ship right in the fabric container. If you do this, remember: Remove the fabric before planting!